Save 10% by April 30th! It’s not too late to reserve your seat in a summer school class or summer camp program, save 10% when you enroll by April 30th. Fairmont's summer school is a six-week program that focuses on reading, writing and math. Classes are in session Monday - Thursday from 9:00am - 12:00pm. Through working with smaller ability groups within their classroom, teachers are able to individualize instruction to give each student a unique blend of encouragement and challenge.Enroll online for Fairmont's six-week summer school only program, or mix summer school with afternoon camp for a full day of fun and learning. Afternoon campers are invited to attend Friday Fun Days at no extra charge. 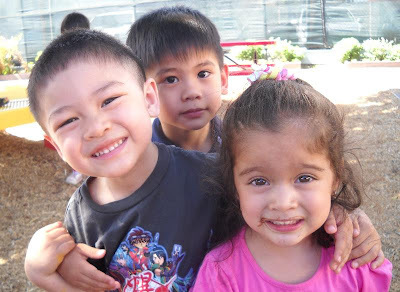 At Fairmont, we mix the academic structure kids need, with the summertime fun they love! See you this summer! Visit https://www.fairmontsummerprograms.com/campuses.aspx, and click on your campus to get the specific URL you’ll need to show the video. It is amazing how fast the Kindergarten year has gone! It is almost time for graduation and another celebration of great achievement. The cost of the package is $20, this includes the cap, gown, and 2011 tassel. Rental gowns are available at the cost of $12 and must be returned at the end of the ceremony. You may use a cap and gown of an older sibling that was used a previous year. A 2011 tassel may be purchased for the price of $5. Please notify the office if a rental gown or tassel is needed so we may have an accurate count of gowns for students. Order forms are available in the front office. Please return them with payment to the office no later than Monday, May 2nd. There will not be a picture make-up day for this session. We would like our preschool moms to join on Friday, May 6th to a "Muffins with Mommy Social" in celebration of Mother's Day. It will begin at 9:30am, just after the flag salute and parent meeting, and finish at 10:30am. If this is not your child's normal day to attend please feel free to bring him/her for the duration of the party. Although we would like to include the whole family, we are unable to accommodate more than our preschool students and their moms. Please make other arrangements for younger siblings so that you are able to spend time with your preschool child. Please fill out the form sent home with your child if you are planning to attend. Return it to the front office no later than Wednesday, May 4th so we know how many preschool students and moms to count.